If you have not checked out Heidi's most recent post, you should do so. She has patterns you can print for a cute polar bear and Tacky the Penguin. She also has a cute play of The Mitten for sale on her site as well as a cute snowman idea from her Little Songs for Language Arts CD. Here are a few random winter things I have done in the past. I have been trying for 2 days to upload this activity for the book Mama Do You Love Me? I have attached a picture below of the project. If you would like it, please just email me and I will send it to you. I used this activity for a lesson on nouns. The Eskimo is from TLC Lessons so I can't include the measurements for it, but it would be easy for you to create just by looking at the picture. If you email me, I will send you more pictures, the words, and the animal pictures that go with the activity. I found a few new blogs today and I wanted to share them. There are some great math game downloads on this blog as well as a bunch of other neat ideas! !Thanks Nancy Bland for sharing your friend's blog with me. Cute reindeer hats here!! Too late for this year, but something fun for next year. I love the alphabet letters under language arts. I love the Candy Land Sight Word version idea!! and great center ideas too! Love the word word center download. 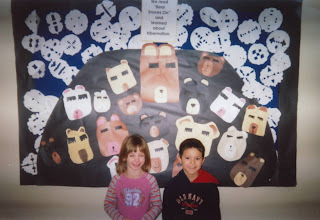 This blog is geared towards gifted kindergartners.What a great resource! I did this bulletin board a few years ago. If I did it now, I would add a writing piece to it. Here are a few of the things I usually do when I celebrate Martin Luther King, Jr. with my class. Primary Perspective: A New Blog!! I am so excited to introduce you to a NEW BLOG!! A former teammate of mine has started a blog and you are all going to LOVE it!! Her name is Brooke Perry and she is a first grade teacher in Mansfield. We taught together for a couple of years and I always got such great ideas from her!! I am so excited to share her blog with all of you!!! She already has several units and activities you can download for free from her page. This is one of my favorite ideas she has posted!! I make these handprint calendars for my parents every year. I am sorry I am sharing this idea so late, but it took me awhile to find the pictures. If you have questions about how to put them together, just let me know. I just purchased a few of Kim Adsit's Christmas units and I love them. She has several to choose from. I bought Ho! Ho! Ho! Santa Pack, Rudolph's Rockin Around the Christmas Tree, and On Christmas Tree. They are full of fun literacy and math activities. I think I like the Ho! Ho! Ho! unit the best. You can find the units at her Teacher's Pay Teachers page. New Ideas From Lesson Plan SOS!! Lesson Plan SOS has posted new December lessons recently and I wanted to tell you about a few that I absolutely love!! I have found so many great ideas using The Gingerbread Man lately and this lesson is no exception. Students are given money to buy materials for decorating a gingerbread man. They have to create a shopping list, figure out if they have enough money for everything they want to purchase, purchase materials, and put together a gingerbread man using the items they bought. The unit comes with everything you need to implement the lesson including a note asking for donation items, price lists, price tags, recording sheets, colored display signs, and pictures of how the lesson works!! I love the examples of what the students creative. What a great way to learn about the value of money. They have a great lesson using present wrapping as a springboard for an expository writing piece. Students write a piece about how to wrap a present, then they have to actually wrap a present using the directions they wrote. As the writing ends, a contest begins to see who wrapped the most perfect present. Students will have so much fun with this lesson!! If you are looking for some how-to writing, they have a great lesson on how to make Rudolph. Students follow simple directions for creating a reindeer out of construction paper, then they write their step by step directions for the project. The reindeer are so cute! One last great writing lesson they have for sell is a point of view Santa writing lesson. Students write a letter to children as if they were Santa instead of the traditional letter to Santa. What a great idea!! All of these lessons could be easily adapted to a kinder room by turning them into a whole group lesson. Students could work as a table or a whole class to make one big gingerbread man, they could all make reindeer and do a shared or interactive writing piece as a whole class for how they made it, and they could write a whole class letter from Santa's point of view. Last week, I taught a lesson on determining sorting rules. We focused on "have" and "have not." I introduced the lesson by activating prior knowledge about basic sorting. Then I called several students up to the front of the carpet and sorted them into two groups. Then I had those seated on the carpet try to determine my sorting rule. I made groups such as "has on blue jeans" and "doesn't have on blue jeans" and "has long hair" and "doesn't have long hair." Then I read the book Liz Sorts it Out. This is a great book for sorting. Next I modeled how I wanted them to sort at their tables. I used two sorting mats and a bucket of fun creepy crawlies. I sorted the critters into two groups- the haves and the have nots and had the students determine my sorting rule. After several examples, they went to their tables to work in small groups with different items. Once they had sorted their objects, they raised their hand and had me join their table to try and determine their sorting rule. Neat Ideas for the Week!! The First Grader at Last Blog has a super cute reindeer word sort. 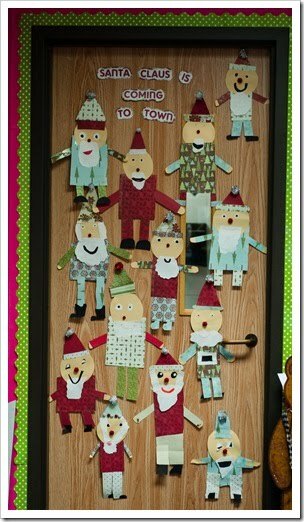 On the First Grade Parade Blog you will find the book A New Improved Santa and some very neat scrapbook santas. 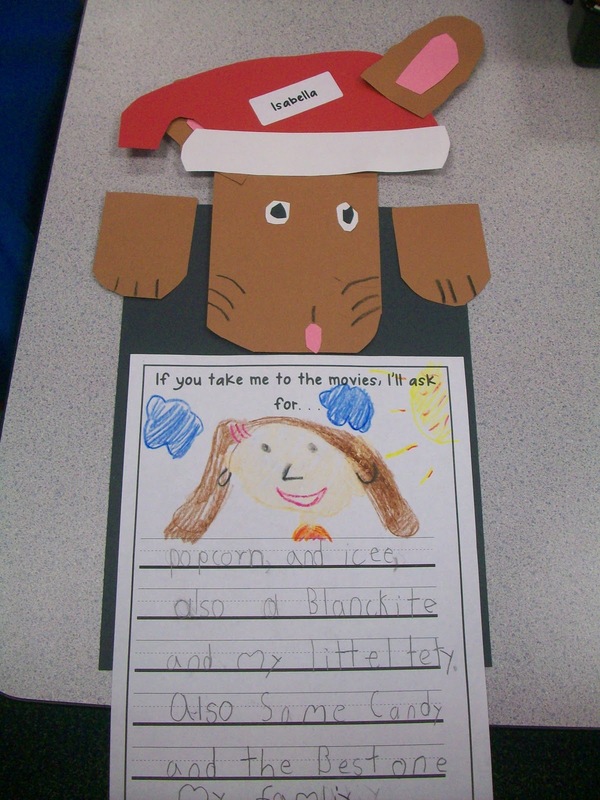 The First Grade Teacher blog has black and white reindeer prints and a job application writing activity where students write about why they would make a good reindeer. If you have not already done so....you have to check out the gingerbread man ideas on Mrs. Lee's blog. You will LOVE them!! I love her gingerbread man and the 5 senses activity. She also has lots of great math activities using the gingerbread man. For more great gingerbread man ideas....go to The First Grade Parade and check out the gingerbread man word sort and estimation activities. You can download the masters from the blog site. I am now a Lettering Delights Affiliate which means that I get a discount when people purchase items from their site through the link on my blog....so if you are planning to purchase some of their alphabets or other products, PLEASE purchase them through the link on my site!! Thanks!! I received this email from Heidi Butkus of Heidisongs today and wanted to share it with you. She is offering a holiday discount on a product and has some free downloads on her blog. I LOVE Heidi's stuff!! My kids have learned so much using her songs!! I have cut and pasted her email below. In the spirit of the season, we want to wish you Happy Holidays with a special deal on our "Little Songs for Language Arts, Singable Books and Seasonal Songs" CD's and DVD's! This set of songs features seasonal favorites like Christmas Countdown, Let's build a Snowman and the Seasons Song, plus many more singable books and other treats. Choose either the DVD or the CD of this special music for only $10, or get both for $20! Add the Printable Projects CD for another $10 and you've got a very special holiday deal for only $30! Use the Discount Code "LangArtSp" in the Shopping Cart to receive these special prices. 1. A free download with directions for some fun holiday projects, including a Santa, elf, and a reindeer. They make a GREAT bulletin board! 2. A free download of some Christmas tree themed counting sheets that help kids count out quantities from 1-30. 3. Information on the upcoming California Kindergarten Conference in Santa Clara, CA in January. 4. Info on one of my favorite holiday projects that helps kids learn their teen numbers: The Christmas Countdown 20-10 Book! This is a "singable book" that the kids make themselves. HeidiSongs Gift Certificates for your favorite teacher, day care provider or active mom! I have been sharing so many whole and small group games and activities on my Blog, that we've made a new page to capture them all! New Video Contest coming in January! Warm up those cameras, we've got our annual Sing-Along Song Video Contest coming up in the new year. Capture the fun as your students sing-along to one of my songs for a chance at some wonderful prizes and we'll feature the winners on my blog and website for everyone to enjoy. I can't wait to see your students in action! Have a great holiday season with your class and a well-deserved holiday break! Recently, I put together these ideas for the kinder and first grade teachers in my district. They are activities and lessons that go with the science TEKS they are teaching this six weeks. The lessons are on rocks, soil, water, day and night, and recycling. There are a few things I gave out as handouts. I will scan those next week and add them to the post then. I found this site called Hoot of Loot. It is an online classified ad for schools, teachers, and homeschools. You can sell your unwanted teacher items and buy other items that teachers are selling for cheap. Just thought I would share the site for anyone who might be interested. I put together all of the ideas I have on using the book the Polar Express. I would love feedback. Do the ideas I wrote up make sense? Is there something I should change? Is there something you really like about it? etc. Please look it over, use it, and let me know how I could make it better!! Can't Get Enough of Other's Blogs!! Here is another new blog to check out. I know Thanksgiving is almost here, but I am already collecting ideas for next year!! Check out The First Grade Parade! Thanks to all of you who commented on all of the wonderful things you are thankful for. I loved reading all of your posts! Through a random drawing, a winner was chosen for the gift certificate. and.... the winner is Gladys!! Gladys, I have sent your email information to the ladies at Lesson Plan SOS and they should be contacting you soon about your gift certificate. Thanks again to all of you for participating!! I am thankful for all of the people I have met through blogging and all of the wonderful ideas I have gotten from all of you!! Happy Thanksgiving!! I used Kim Adsit's 5 Little Turkeys Lesson from her Thanksgiving unit and her Turkey Glyph Lesson this week. For the 5 Little Turkey's Lesson- I read the book the first time just for fun. Then we reread the book several times so that students could act out the story. I used a white chef hat for the cook. After reading and acting out the story, I used a farm work mat to act out story problems as a whole group model. Each story had some turkeys playing and some hiding. We focused on making different combinations of the number 5. After a whole group model, I had students use their own work mat and 5 little turkeys to act out the problems themselves. Kim's unit has several options for recording sheets. She also has the pages for the 5 Little Turkey's book. After some practice, I had students make up some of their own story problems and share them with a partner. The farm pictures for the work mat are not included in the unit. I added them for some additional support for the students I was working with. The teacher turkey book is designed as a flip book. You flip the pages down for each question and Velcro the pieces on your turkey as a model for the students. I was in several schools this week and saw these ideas and thought I would share.